One of the joys of exploring the Galapagos Islands is that its done by boat. I wanted to somehow attain that feeling that I was like Darwin, arriving on a ship as an explorer and amazed at what I saw. I sensed my fellow shipmates shared that excitement, as we gazed out at the first island in our sights. From afar it looked quiet and perhaps desolate, with little to attract the attention. But then we saw this frigate bird flying above, sharing the breezes above us as it checked us out as much as keeping an eye on the sea and the nearby Galapagos island. It held steady, flying in tandem as the ship moved on the waves, and with our anticipation of what next we would see, I knew the bird already knew. I wondered what the frigate bird knew, what it could tell us of what to expect next. 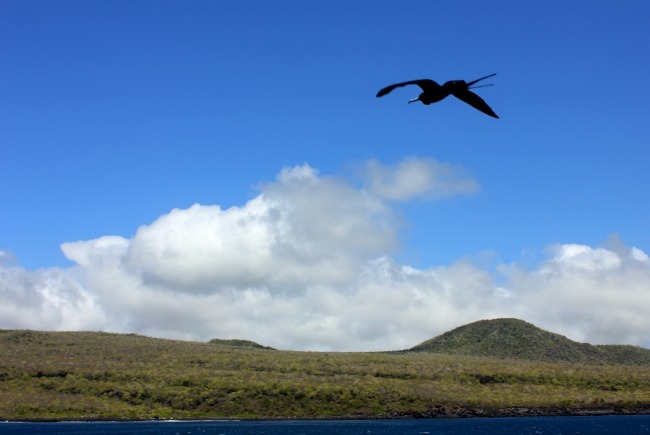 I wondered if when Darwin and his ship had come close to the Galapagos Islands, if a frigate bird’s presence had incited their desire to discover. I watched the frigate bird, gliding along, as we hugged the shore of the island, heading for our spot to go snorkeling. And as I watched I knew it was a good omen for this bird to be with us, even if it wouldn’t reveal what we would see.